"Thank you so much for providing us with the beautiful flower arrangements and centerpieces. It all came together so perfectly. Thanks again!" "The flowers were beautiful! They certainly added to the decor and helped the guests and us appreciate such a beautiful setting. The flower crown was special...Thank you again for your part in our daughter's wedding. We will highly recommend you to others!" "...You have been exceptional to work with. We really appreciate you traveling to Philly and making all the stops you did to beautify our venues. We are very happy to have chosen Flourish Flowers for our wedding." "Thank you so much for making my reception so memorable with all the beautiful flowers. I really appreciate your sweet demeanor and all the time you took to make sure this process was fun and easy. Thank you." "I loved working with [Flourish]! I wouldn't look anywhere else. Trisha was so easy to work with and had so many good ideas to go along with my theme. My flowers were beautiful and our boutonnieres were more than I could have imagined! Thanks Trisha and all your staff!" "Trish did my flowers for my wedding this summer and she did a fantastic job!! She was very fun to work with. I LOVED my bouquet! I highly recommend her!" "I honestly cannot give enough praise for the phenomenal work done by Trisha and her team on our wedding day. I was absolutely floored when I saw our bouquets - they were EXACTLY what I had hoped for and imagined, and more. "This lady is world-class in my opinion. I would have absolute confidence in her to deliver expert artistry to any event regardless of size or distinction. Keep it up, Trish!" "Thank you so much for doing the wedding flowers. They were more beautiful than I ever imagined." 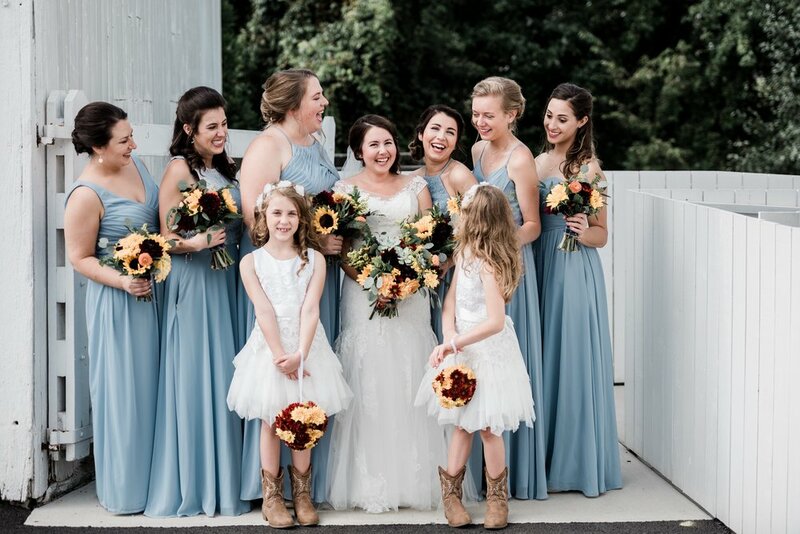 "I'm not sure that I will be able to actually express just how much I LOVED my bouquet and all of the bouquets and especially my floral crown!! The flowers arriving was honestly one of the highlights of my wedding morning. You guys did such an amazing job and I was so blessed by it." "Thank you for the lovely flowers! They made the wedding reception SHINE." "Thank you so much for the gorgeous, beautiful flowers. They were everything I imagined and more." "I loved the flowers you did for my wedding! I even told my husband that if he gets me flowers on my anniversary, he should just ask you to make a bouquet similar to what you did for our wedding. I would recommend you to anyone looking for a florist." "The flowers were beyond beautiful and we couldn't have been happier! Thank you for all of your time and patience...there are no words for your kindness and efforts! You are one talented lady and will make sure to recommend you to anyone needing GORGEOUS flowers." "Thank you so much for being the florist for our big, special day. You did a phenomenal job. The flowers were gorgeous!" "Thank you so much for supplying the flowers for our wedding! They were absolutely perfect and lasted well beyond the wedding day so we could continue to enjoy them. I couldn't have asked for more perfect flowers to really complete our look. Thanks!" "Thanks for everything! You have been a joy to work with." "Thank you so much for supplying the flowers for our wedding! They were absolutely perfect and lasted well beyond the wedding day so we could continue to enjoy them.